"Attacks on activists are not part of state policy in any way." 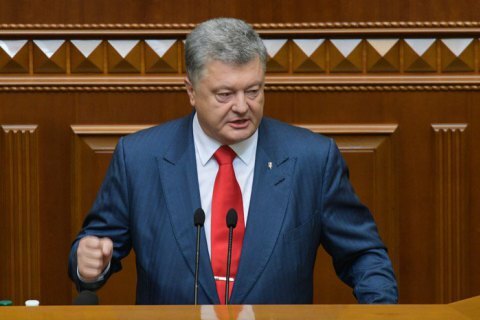 President Petro Poroshenko has warned against political speculations over the murder of Kherson activist Kateryna Handzyuk. He said that he was interested more than others in having the case solved. At a meeting with young people in Kyiv, he recalled that five suspected attackers had already been detained, and urged law enforcers to continue working on the case. "I want everyone to understand that political speculations on the issue will not bring clarity to the case, rather they could make things even murkier. Therefore I am calling on both progovernment and opposition forces not to make empty-worded remarks. Lest you do PR on blood," he said. The president said that the state had nothing to do with attacks on activists which have become massive in 2018. "Attacks on activists are not part of state policy in any way. On the contrary, the recent history shows us some very effective cooperation between the Ukrainian authorities and civil society," he said. There are around 20 theories behind the crime currently being checked by investigators, he said. On 31 July, an attacker splashed sulfuric acid at Handzyuk's face outside her house in Kherson. With 40% of her skin burnt and eyes badly injured, she has had a dozen surgeries. Five people are suspected of involvement in the 31 July attempted murder. All of them took part in the Donbas war as members of the Ukrainian Volunteer Army. Some of them were decorated for their courage. The masterminds of the murder, however, are unknown.